Unfortunately, the abuse of children is not limited to the Castros but is a feature of communism. 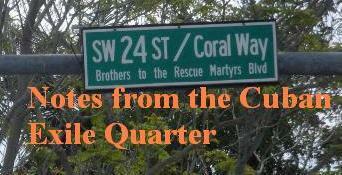 In the case of Cuba under communism children have not only been abused but also massacred. This is not an isolated occurrence. There is a larger pattern seen across the communist world. For the sake of brevity this entry will touch on five: Romania, China, Cambodia, Ethiopia, and Ukraine. Imagine for a moment being born and placed in a cage as a newborn washed via a hose with cold water and never experiencing human touch. Fed like an animal and contracting HIV, hepatitis, and other diseases through dirty needles used to inject the child with vitamins. All of this done to sell the children, as one would any other commodity, on the international black-market. Heartless capitalists? No, heartless Marxist- Leninists in the Ceausescu communist regime in Romania. The regime decided it needed to increase its population and in 2013 Scientific American explained how this crime was systematically planned out and its aftermath in the article Tragedy Leads to Study of Severe Child Neglect. Nicolae Ceausescu decreed in 1966 that Romania would develop its “human capital” via a government-enforced mandate to increase the country's population. Ceauşescu, Romania's leader from 1965 to 1989, banned contraception and abortions and imposed a “celibacy tax” on families that had fewer than five children. State doctors—the menstrual police—conducted gynecologic examinations in the workplace of women of childbearing age to see whether they were producing sufficient offspring. The birth rate initially skyrocketed. Yet because families were too poor to keep their children, they abandoned many of them to large state-run institutions. Hundreds of thousands of children were subjected to this. Producers/directors Brian Woods and Kate Blewett uncover the systematic neglect of abandoned babies in Chinese state-run orphanages. They find "dark rooms" where the weakest and least liked children are left to die. These are known as "The Dying Rooms." China’s one-child policy has created a race where most families desire boys and therefore parents are forced to abandon their babies. 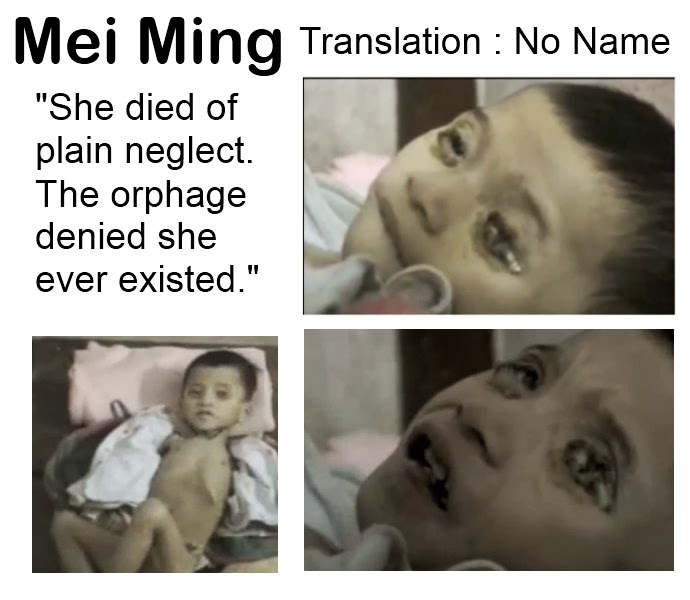 Their unfortunate and tragic lives are left at the mercy of these orphanages where their sad fate is ultimately decided by the staff and ignored by the government. "But the most telling evidence came from government records themselves that document how many of the children in their care have died, and how long it took them and they called it a 'Summary Resolution'". 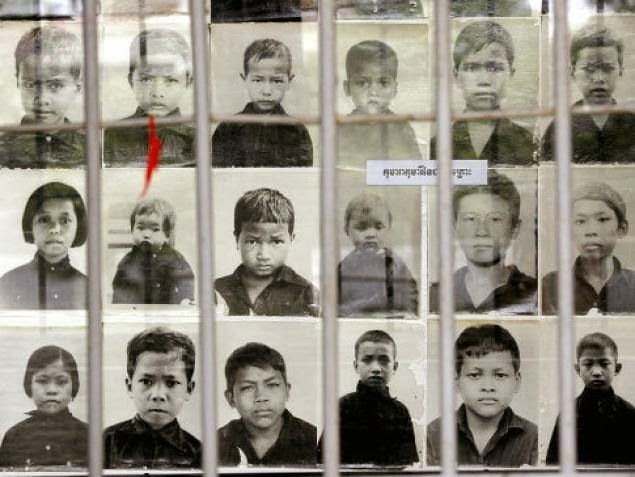 The people on the Khmer Rouge death list were the group called the city people. They were the "new" people. These were any Cambodian men, women, girls, boys, and babies who did not live in their "liberated zones" before they won the war in 1975. 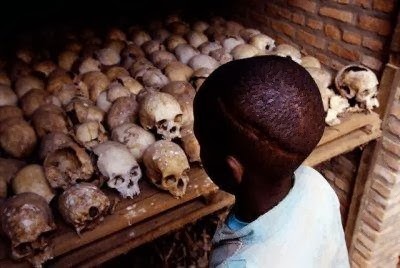 During 1977-78, a conservative estimate of over 30,000 Africans perished as a result of the Red Terror unleashed in Ethiopia by the communists and their Cuban allies. Amnesty International concluded that "this campaign resulted in several thousand to perhaps tens of thousands of men, women, and children killed, tortured, and imprisoned." Sweden's Save the Children Fund lodged a formal protest in early 1978 denouncing the execution of 1,000 children, many below the age of thirteen, whom the communist government had labeled "liaison agents of the counter revolutionaries." This pattern of systematic brutalization and mass murder of children goes back to the first communist regime, the Soviet Union. Holodomor literally means death by hunger. 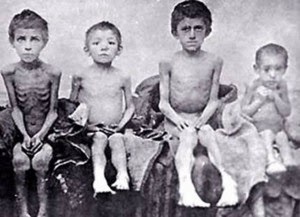 In 1932 and 1933, a vast famine in Soviet Ukraine killed three to seven million people, according to estimates. While people starved, the grain was shut away in barns for export. Communists advocate and carry out policies to end families and replace the role of parent with the communist state. This means that the extrajudicial killings of children in communism are acts of state filicide. Filicide is the act of killing one's own son or daughter. They say, 'means are, after all, means'. I would say, 'means are, after all, everything'. As the means so the end. There is no wall of separation between means and end. Indeed the Creator has given us control (and that too very limited) over means, none over the end. Realization of the goal is in exact proportion to that of the means. This is a proposition that admits of no exception. You did a pretty good job of highlighting examples of communism's cruel treatment of children. However, you accidentally left out North Korea and also Mao-era China. 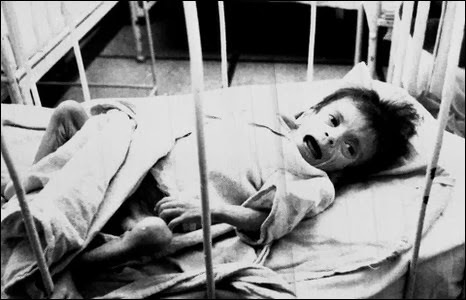 One of the results of the famine that ravaged North Korea in the late 1990s is that children are physically very short, and most of them exhibit very sad faces b/c they pity their regime for diverting precious funds to developing atomic weapons and advanced ballistic missiles. Also, in Mao Zedong's China, during the Great Leap Forward, if any children stole food, they had their fingers chopped off. Thank you and you are correct there are many more and horrific examples of the cruel treatment of children under communist regimes. Will look into the examples you raised of North Korea and Mao-era China.